Hailey Green, who's still grieving her brutally murdered sister, hasn't seen Mac since he fled town in disgrace. Forced to raise her siblings, Hailey still relies on no one but herself—until the man who killed her sister returns. Turning to each other while seeking answers, Hailey and Mac find their old desires reignited and realize that the only life worth protecting is one together! Circumstances tore them apart, but the yearning they still feel for each other the second they come back into contact proves that time doesn’t heal all wounds! 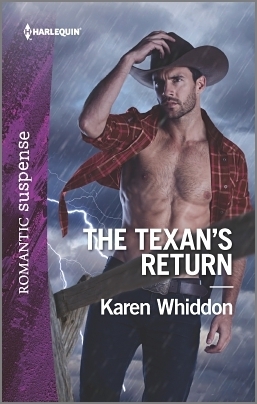 A reunion with a twist takes us for a ride in the latest by Karen Whiddon. A detailed plot and interesting characters keep our attention as we set out to figure out who is telling the truth! Years ago Mac Morrison was forced away from his life and the love and friendship he had shared with Hailey Green. His father was accused of murdering her sister and his family was ostracized and forced to leave Legacy, Texas. His father is now dying, and the one thing he wants before he goes is to have his name cleared of this heinous crime he swears he didn’t commit! Hailey Green had her future ripped away from her when she had to step in to raise her younger siblings after her sister’s murder. She might have a sudden flare of attraction go through her body when she sees the man Mac has become, but she can’t stand to look at him and remember what his father did … but as she stops and actually listens to what he and his father have to say, she has to wonder … did the cops get it wrong all those years ago and her sister’s killer is still out there?